Compact, uniform and early blooming, great fragrance. 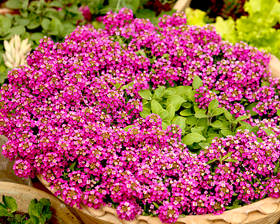 As all of the Alyssum	family, can be used for edging, beds or baskets. Indirect or direct sowing. Direct sow as soon as the ground thaws. Sow again midsummer for fall bloom. For earlier flowers they can be sown under glass, germination takes 7-14 days at 18C, pricked out into boxes and planted out when the weather is mild.